Description A black and white photograph of a small outline map of Flaxbourne and an unsourced word description of the area. "Flaxbourne. 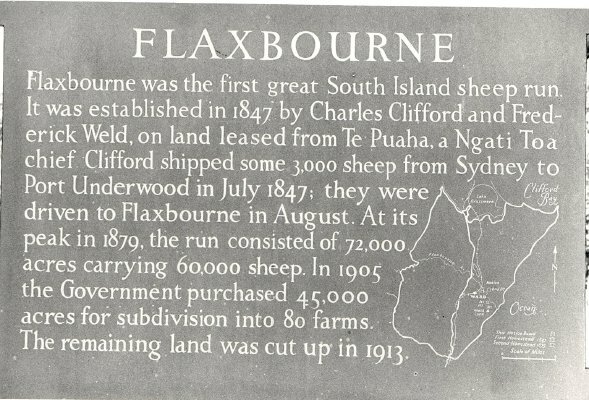 Flaxbourne was the first great South Island sheep run. It was established in 1847 by Charles Clifford and Frederick Weld, on land leased from Te Puaha, a Ngati Toa chief. Clifford shipped some 3,000 sheep from Sydney to Port Underwood in July 1847; they were driven to Flaxbourne in August. At its peak in 1879, the run consisted of 72,000 acres carrying 60,000 sheep. In 1905 the Government purchased 45,000 acres for subdivision into 80 farms. The remaining land was cut up in 1913."